*There are scuff marks around the sides from use. 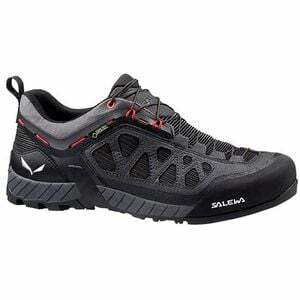 Long treks to the crag or rocky hikes with lots of scrambling involved are specialties of the Salewa Men's Firetail 3 GTX Approach Shoe. This technical approach shoe offers the combination of grip, durability, and comfort needed to handle everything from long hikes on maintained trails to scree field climbs. The EXA Shell grid structure wraps around your upper foot to provide a precise fit and perfect front-foot balance while also minimizing abrasion of the breathable mesh upper. The 3F System connects to the lacing to wrap around your heel and mid-foot as you tighten the laces in order to lock your heel down and reduce fatigue and friction. The upper is backed by a Gore-Tex Extended Comfort membrane for supreme waterproofing and excellent breathability. Cleansport NXT antimicrobial technology inhibits the growth of odor-causing microbes to limit foot funk. A wide climbing area behind the toes on the Vibram Reptile outsole helps you climb and scramble with confidence, and its Megagrip compound ensures dependable traction on wet and dry surfaces alike.